Bangkok’s Suvarnabhumi airport is one of two International airports serving this popular destination. Suvarnabhumi opened in 2006 and is one of the twenty busiest airports in the world and the sixth busiest airport in Asia. The airport authorities will happily tell you that Suvarnabhumi airport regularly tops the polls as the most popular location worldwide for the taking of instagram photographs. What the airport authorities are less likely to tell you is that Suvarnabhumi is also the most haunted airport in the world and that ghosts have been blamed for a host of problems including a breakdown of the baggage handling system and even an accident involving a Thai Airways International aircraft. The problem has become so serious that the airport has built a number of condominiums specifically to provide attractive housing for the ghosts in the hope that this will keep them away from the passenger terminal and aircraft operations. 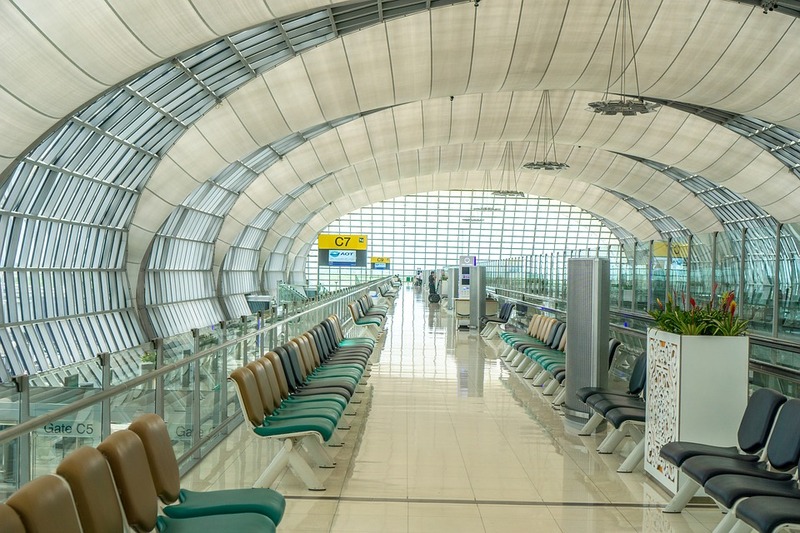 Though it now looks plush and efficient, Suvarnabhumi’s problems began at a very early stage. The need for a new airport was recognized in the mid-1970s – Don Muang, the other airport in Bangkok, started life as a US Air Base and was struggling to deal with the sheer volume of traffic. What was needed was a purpose-built airport with good rail and road connections to the centre of the city. A possible area for construction was quickly identified to the east of the city. There were however, a couple of problems. First, the area was a snake-infested swamp known as Nong Nguhao (Cobra Swamp) which would make construction of the new airport challenging and very dangerous for workers. Second, the area also included the site of an old graveyard and Thai people are very, very nervous about disturbing the rest of the dead. Work on building the new airport finally began in 2002 though, as for most major construction projects in Thailand, there were immediate accusations of corruption and the use of inferior building materials and practises in addition to delays and budget over-runs. Some of the delays were caused by frightened construction workers. Not only were cobras displaced and very aggressive when their swamp was drained, there were frequent reports of ghostly figures moving around on the site. When challenged about how and where they had relocated bodies from the graveyard on which the airport was built, members of the consortium responsible for building work suddenly became very vague and were unable to remember where precisely the bodies had been re-buried. Reports of ghosts became so prevalent and caused so many work stoppages that on 23rd September 2006 (before the airport was opened to the public) the Airports Authority of Thailand organised a phiti tam bun phuea phensirimonkol (a merit-making ceremony for prosperity) at the airport. Ninety-nine respected Buddhist monks from temples and monasteries around Thailand were invited to undertake the ritual chanting required to ensure that the airport would be free from ghostly interference. In addition to the monks, the ceremony was also attended by around 350 airport staff – one of the main purposes of the ceremony was to reassure staff about what had already become known as a haunted building. This was not a notable success. During the chanting, Kwanchai Tabto, a young parcel inspector, collapsed and then announced that his body had been possessed by Pho Ming, the guardian spirit of Cobra Swamp. Pho Ming announced that he was displeased because his home had been destroyed by the construction of the airport and demanded that a shrine be built for him on the airport grounds immediately. The airport authorities reacted by building not just one but a total of six shrines around the airport in a effort to appease Pho Ming and other entities which seemed to haunt the airport. Despite this, ghosts continued to appear. One of them was the ghost of a female Burmese construction worker who had died during the building of the main terminal. The woman fell into a column mould as concrete was being poured into it and was crushed. When the mould was removed, the woman’s body was trapped inside the set concrete. Workers using power tools removed as many parts of her body as possible, and then used a new outer skin of concrete to conceal what was left inside. This column (which is inside the customs hall) was believed to be haunted and several night-shift workers at the airport reported seeing the ghost of a long-haired woman lurking close to the concrete column. This story became so well known that it was reported in the Thai Rath daily newspaper which also noted that workers had taken to leaving gifts by the column to appease the angry female ghost. In addition to the column ghost, night workers at the airport also heard ghostly footsteps echoing throughout the empty halls and the sound of Thai traditional music with no obvious source. Ghosts continued to plague Suvarnabhumi. A major failure in the baggage handling system soon after the airport opened was blamed on interference by evil spirits. Supernatural involvement was also suspected in the deaths of two airport workers in separate road accidents close to the terminal. General unease increased when a number of people (both Thais and International visitors) committed suicide by jumping off the terminal’s fourth floor level and falling to the car park below. In response, the airport authorities supplemented the existing shrines by adding a number of “ghost houses” round the airport. Ghost houses are common next to large commercial buildings in Thailand as well as near some private houses. These are small, ornate constructions which look almost like doll houses and which are placed on pedestals close to the building which is to be protected. The ghost houses are always kept immaculately clean and well supplied with food and drink for ghosts - Cherry Fanta is said to be very popular with ghosts, and this is often left in ghost houses to attract the spirits. The idea is that the ghost house will be so attractive to any wandering spirit that they will choose to live there rather than enter the main building and bother the living occupants. A number of ghost houses were built round Suvarnabhumi Airport in an attempt to keep ghosts out of the main airport buildings. Then, in September 2013, ghosts were involved in an aircraft accident at Suvarnabhumi. A Thai Airways International Airbus A330 aircraft en-route from Guangzhou in China ran off the runway while landing on runway 19L at around 23:30 on 8th September. The aircraft’s undercarriage collapsed and the wreckage came to rest completely off the runway. Fortunately there were no fatalities though twelve passengers were injured and the aircraft was written-off in the accident. It was quickly reported in the local press that there had been supernatural intervention during the evacuation of the aircraft. Several passengers reported being assisted from the aircraft by a stewardess wearing traditional Thai dress. Thai Airways noted that none of its staff wear Thai traditional dress and it was concluded that this must have been one of Suvarnabhumi’s resident ghosts. Chotisak Asapawiriya, former CEO of Airports of Thailand (AOT), was quoted in the Thai press as noting that several airport staff had also seen a woman in traditional dress and heard a woman’s voice on runway 19L before the crash. Another AOT source noted that during the response to the accident, airport emergency personnel saw a woman in Thai traditional dress on several occasions and noted that appearances of this woman caused interference on radio equipment. As you might expect, there was an immediate enquiry into why this modern jet aircraft had careered off the runway. On 15th September the Managing Director of Thai Airways International, Mr. Sorajak Kasemsuvan, publically announced that preliminary investigations had proved that “vengeful spirits” were a primary cause of the incident. His urgent recommendation was that a ceremony of appeasement for the angry ghosts of Suvarnabhumi was required. Mr Sorajak was publicly supported by several prominent figures in the Thai aviation industry including the Head of the Thai Meteorological Service who agreed that Suvarnabhumi airport was haunted by a number of malevolent ghosts who caused regular problems with systems and equipment as well as terrifying staff. A ceremony of appeasement was generally agreed to be a prudent response to the accident but it was also suggested that the sheer volume of ghosts at the airport was such that existing ghost houses were becoming too crowded and therefore no longer attractive to ghosts. The answer: a giant ghost condominium should be built which would provide adequate accommodation for all the spirits which haunt the airport! The giant ghost Condo was duly built, but there are still very regular sightings of ghosts at Suvarnabhumi which suggests that it hasn’t been entirely successful. Workers and visitors to the airport continue to report sightings of a mysterious woman dressed in traditional Thai costume who disappears when she is approached. Ghostly footsteps continue to be heard as they pass along the many corridors and rooms of the airport and the sound of Thai traditional music continues to be heard inexplicably and randomly in all parts of the terminal. Since the accident in 2013, the ghosts of Suvarnabhumi do not seem to have made any further attempts to interfere directly with aircraft operations, but if you do happen to find yourself passing through this airport, you may want to check that the lady you see in Thai costume really is a flight attendant.